Tan Sri Vincent Tan’s Berjaya Group will be looking to open 1,000 RadioShacks in Asia with the first RadioShack planned to be open in Kuala Lumpur this year after becoming RadioShack’s master franchiser. Berjaya Retail Berhad is part of a group that operates everything from 7-Eleven, Starbucks and Krispy Kreme stores to units running lotteries, casinos, hotels, schools, utilities, online payments and Mercedes van dealerships. Tan announced in February that he was turning over day-to-day management of his Berjaya group to the eldest of his 11 children, British-educated Robin Tan, 37. Berjaya means “success” in the Bahasa Melayu language. Berjaya RS Sdn. 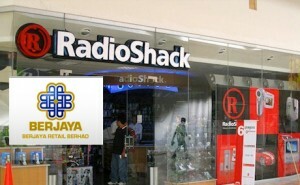 Bhd., a retail management unit, plans to open the first RadioShack in Kuala Lumpur, the capital, this year. “The RadioShack brand will complement our other retail successes not only by widening our product range, but also in terms ?of fulfilling our aim to ?deliver greater convenience to customers,” said Yau Su Peng, chief operating officer. “It affords us the opportunity to expose the market to a growing lifestyle trend in electronics and gadgets whereby accessories and IT peripherals are an integral part of modern urban life,” she said in a statement. Besides Malaysia, the new plan calls for RadioShack to expand into the Philippines, Indonesia, Singapore, Cambodia, Laos, Myanmar (formerly Burma), Thailand, Vietnam and Brunei. Neither side disclosed financial terms of the deal.